The morning glory is one of my favorite flowers because they are delicate and hardy at the same time. I have a small, white trellis on my patio that is just teeming with morning glories. I especially love the blues and pinks. I like to look out the window at them as I’m sipping my morning coffee. I planted a handful of morning glory seeds last spring, and it wasn’t long before I noticed the vines racing to the top of the trellis! I’m so glad September has such a remarkable birth flower. Did you know that morning glory vines can grow to a height of 15 feet? When I look closely at the vines wrapped around my trellis, that’s easy for me to believe. Morning glories are native to warmer parts of Asia. Though they like the warm weather, they can be seen in many growing zones throughout America. There are hundreds of species of this colorful flower. Morning glories can be seen in lovely shades of pink, orange, red, white, purple, and blue. Sometimes, they feature two colors, such as a combination of deep pink and white. Morning glories are warm-weather flowers that need full sun to grow. Be sure to choose a location that shelters your morning glories from the wind. Planting them beside a house or next to a tall tree are two ideas to consider. Keep in mind that they are fast-growing and can sometimes crowd out other flowers. Along with lots of sunlight, your morning glories need to grow in fertile, well-drained soil. They are low-maintenance blooms, so you only need to give them water during dry periods. 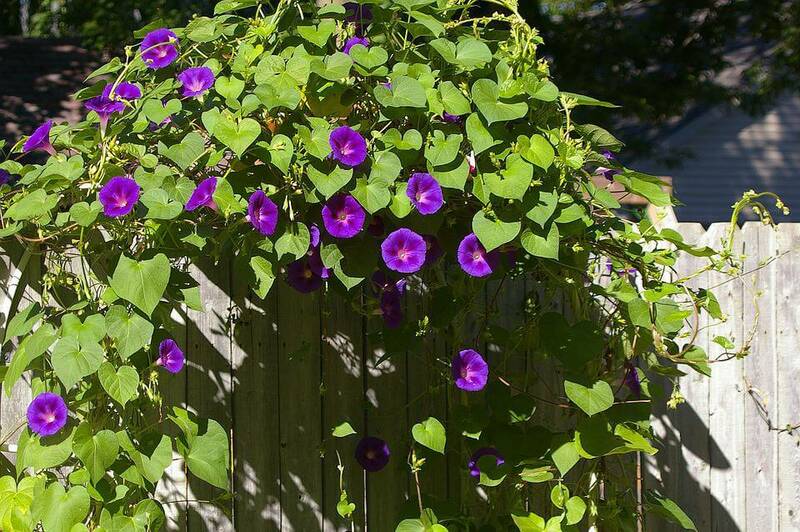 If you plant morning glory seeds in a garden, put them next to a trellis, fence, arch, or pergola so they have a place to climb. If you are feeling creative, you can make your own morning glory trellis. Be sure to do your planting after the very last frost when the ground warms to at least 65 degrees. If you decide to plant them in a container, position a portable trellis next to the pot so the vines have something to latch onto. The Scarlett O’Hara is a variety of morning glory that is bright red with white inside the flower. Morning glories are a favorite with passers-by including butterflies and hummingbirds. 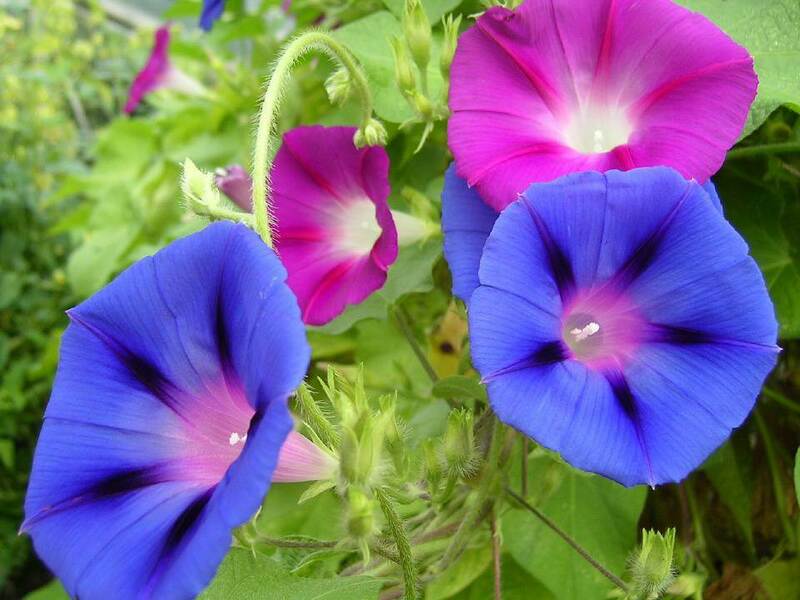 The seeds of a morning glory are poisonous. The leaves of a morning glory are heart-shaped, while its petals have a trumpet shape. This flower is a symbol of unrequited love because of the short time it is open in the morning. Separate the parts of the word “ipomoea” (the Greek name for the morning glory) and it translates to “worm-like.” This refers to the thin stem of this unique flower. Morning glories are around until the first frost, so be sure to enjoy them before they disappear. But don’t worry: They will be back with the warm weather.